​A conversation centered around the relationships that are shaping our lives and landscapes today. An introduction to various land ethics and how the relationship we have with land can shape the culture we live in. Moderator: Kimberly Carfore, Professor of environmental studies USF. Kincentric Ecology - On the relationship of how our food choices shape the cultural and physical landscapes we live in. 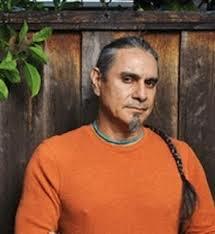 Enrique Salmón, is a Rarámuri (Tarahumara) Indian. He has a Ph.D. in anthropology from Arizona State University. He is head of the American Indian Studies program at Cal State University East Bay. Dr. Salmón has published several articles and chapters on Indigenous ethnoecology, agriculture and ancestral food ways, nutrition, sustainability, and traditional ecological knowledge. His recent studies have led him to seriously consider the connections between climate change and indigenous, traditional foodways. Dr. Salmón is author of the book, Eating The Landscape: American Indian Stories of Food, Identity, and Resilience. Ruthie King, Livestock Manager of the New Agrarian Collective and Director at the School of Adaptive Agriculture in Mendocino. "Grazing from the grasses point of view" written and directed by Ms. King explores the context of ancient relationships between animals, humans and annual and perennial grasses.